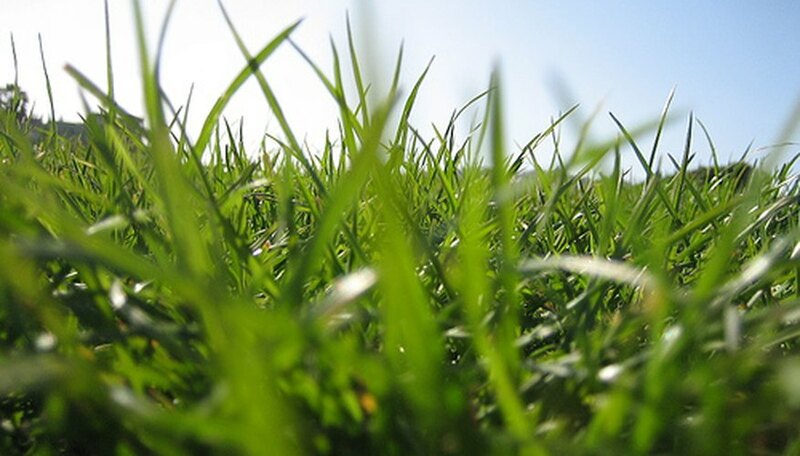 Bahia grass is popular in the South because it grows in most soil conditions and is resistant to drought, insects, and disease. Its aggressive growth patterns and deep roots make it ideal for erosion control along roadsides and highway rights of way. In some areas, Bahia grass is considered an undesirable weed and is hard to control. It is easily recognizable by its two-pronged seed head shooting up from the lawn. Plant Bahia grass from seed or by laying sod. Sowing Bahia grass seed is the least expensive option. Purchase scarified seed, if available, to speed germination. Sow seed or lay sod in the spring or early summer. Plugging is not recommended because Bahia grass grows slowly, leaving large areas bare and susceptible to weeds. Water the newly-planted grass twice a day during the first two weeks, then slowly taper off to an as-needed basis. Water established Bahia grass when the blades begin to wilt, turn blue-gray in color or when footprints remain visible on the grass. Apply approximately 3/4 to 1 inch of water in the evening. Avoid over watering. Bahia grass is tolerant to drought. During drought conditions, Bahia grass will turn brown but will grow again when water is available. Mow Bahia grass every 7 to 14 days during the summer. Maintain the grass height at 3 to 4 inches. Mowing Bahia grass too low will stress the grass and reduce its tolerance to heat and drought. Bahia grass grows low to the ground, and mowing requirements often are determined by the growth of tall seed heads. Fertilize dry Bahia grass and water thoroughly. Avoid fertilizing during the heat of the day. Improperly applied fertilizer can burn the lawn and damage Bahia grass. Apply a complete fertilizer such as 16-4-8 during the months of April, June and October at a rate of 1/2 to 1 pound per 1,000 square feet. Apply ferrous sulfate or chelated iron during March, May and September when the temperatures are less than 80 degrees and grass is dry. Water the grass immediately after application. Use pre-emergence herbicides in late winter to control weeds. Bahia grass is damaged by post-emergence herbicides, including many of the popular “weed-and-feed” type fertilizers. Do not use these products on Bahia grass.